With just four days to go and most of us thinking about our normal Bank Holiday routines rather than the election it did seem it was another of those non-days of this campaign. Even from the politically battle hardened lobby journalists seems to be struggling to make sense of what should be the most exciting election for a generation, but which is still boring the pants off most of us and the electorate. I guess the lack of focus today or any excitement sums up the campaign to date. 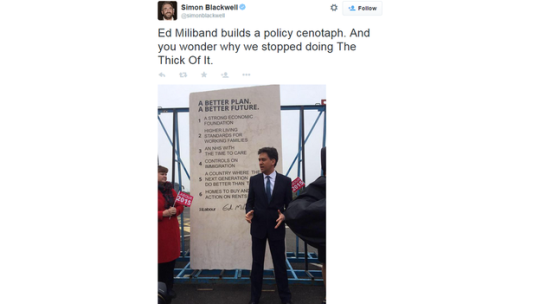 The only highlight of my day (true I have been out at a Charity Rugby Game so have only relied on snippets of twitter and web news) was the social media reaction to the ‘Tablet of Stone’ unveiled by Miliband. It did seem a little too close to a “Thick of It” script. A bit of me rolled my eyes, but then I realised of course not everybody reacts to a twitter storm in the same way and the people Labour wanted to reach are those who needed some solid rock guarantees. I think it seems a similar risk was taken by Ed going to see Russell Brand earlier this week. A story in the Guardian hinted that the Postal Votes were a disaster for Labour in the marginals and the anti SNP messaging from the Tories was working. Who said negative campaigns don’t work? the public hate them but then fall for them and vote accordingly. It is so depressing. 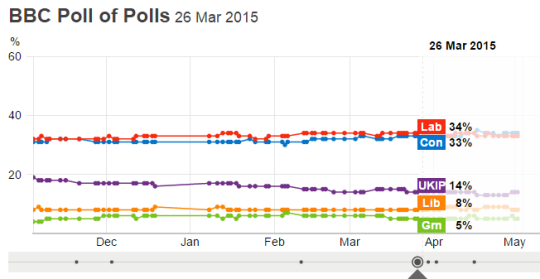 To make the deadlock worse the Poll of Polls is also showing a dead heat. Given the changes in Scotland and the Ashcroft Polling showing a large variation in the Key seats there is still all to play for on Thursday. An extra 5-10 seats here and there will put each party in a completely different bargaining position after Thursday so they will be out over these last 4 days chasing every vote in the 200 seats that matter. So all to play for. I have shifted my predictions a little over the last week doing a little more analysis and taking into account the slightly hardening of the Tory vote and the inability of UKIP to get back up to the 20% that would really hurt the Tories. We are in for a very messy political week. It is not even clear we will have a government by this time next week. For us political nerds this is all very exciting. This entry was posted in Uncategorized and tagged GE2015, labour, polls, tory by andyreednet. Bookmark the permalink.